On Friday the 16th of November two groups of Deloitte staffers visited the Asylum Seeker Resource Centre (ASRC) to volunteer as part of Deloitte’s Annual Impact Day. Each year Deloitte employees mobilise around the country to provide charities with an extra helping hand. This year the ASRC was fortunate to have teams from Deloitte in our Harvest of Hope garden, Community Meals kitchen and at the ASRC Foodbank in Footscray. The Harvest of Hope Market Garden is an urban farming initiative providing fresh produce to the ASRC Foodbank and Community Meals programs. In peak harvest time, the garden produces up to 40 crates of fresh produce for the ASRC each week. The team of volunteers from Deloitte weeded Chilli beds and prepared a new garden bed, ready for sowing. While getting their hands dirty in our community garden the group got to know more about the ASRC and its many programs. 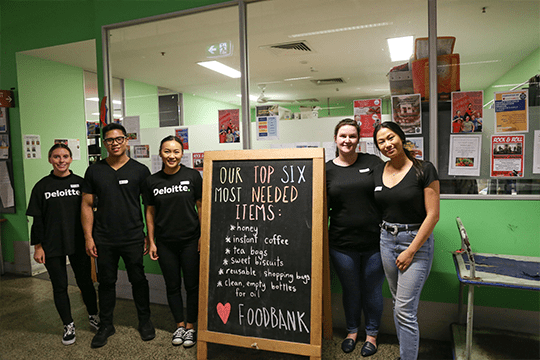 Deloitte has recently included the ASRC in its workplace giving program, allowing staff to make a pre-tax donation directly through their employer. If you’re interested in workplace giving for yourself or your organisation you can find out more here.